Upcoming Events Organ Concert: And Friends Saturday, July 29, 2017 | 7:00 p.m. The Great Organ Spook-tacular Saturday, October 28, 2017 | 6:00 p.m.
Don your favorite costume and bring the entire family to a pipe organ concert perfect for all ages! With music ranging from Bach’s famous Toccata & Fugue in D Minor (known to many as the “Phantom of the Opera”) to a medley of tunes from Harry Potter, PUMC’s family-friendly Trunk-or-Treat tradition concludes with this open-to-all, informal onehour concert. by Jeanne Demessieux for a recording made around 1959. Demessieux takes Handel’s themes and gradually merges them with her own twentieth century harmonic style, each phase seemingly more daring than the previous. A short Adagio provides a moment of repose before a dance-like Andante concludes the concerto. One can imagine dancing a graceful minuet to its lilting rhythms, which underpin two increasingly complex variations on its theme. Around 1930, Louis Vierne was asked to make some recordings on the famed Cavaillé-Coll organ at Notre-Dame Cathedral in Paris. In addition to composed works of his own and Johann Sebastian Bach, he documented his famed abilities as an improviser, recording three works which were created spontaneously, and captured on 78 rpm records. Some years later, Maurice Duruflé, a student of Vierne and a great composer in his own right, wrote down these improvisations while listening to the recordings repeatedly. The beautiful Méditation conjures a tranquil mood, and explores the organ’s lush flute and string registers. Franz Liszt, the pianist of international fame, also had a great deal of enthusiasm for the pipe organ. Liszt’s organ improvisations were remarkable enough to have been admired by Saint-Saëns and Widor. Liszt epitomized the master transcriber of the 19th century, seemingly arranging anything that pleased his ears, stretching from Bach’s fugues, Beethoven’s symphonies, and Schubert’s lieder all the way to operas by Bellini, Donizetti, Verdi, and Wagner. It seems therefore appropriate to perform transcriptions of Liszt’s own works for instruments other than they were originally conceived. Liszt himself transcribed his Mephisto Waltz No. 1 for piano solo, and it remains a concert staple to this day. The version of this work to be performed today is an arrangement combining material both from the orchestral score, and Liszt’s piano adaptation. Liszt’s two versions differ substantially, particularly in the musical textures chosen during the central “waltz” section of the piece. Dating from 1859-61 and first performed at Weimar in the latter year, the Waltz is the second of Two Episodes from Lenau’s Faust and is known both as “The Dance at the Village Inn” and as “Mephisto” Waltz No. 1 (the first of four pieces thus titled). Liszt was fascinated by the tale of Faust and wrote many works inspired by elements of the story. Nikolaus Lenau (1802-50) was a partly Hungarian poet who wrote mainly in German and went mad in 1844. His Faust (1836) is a lengthy verse epic often of mystically religious character with descriptions of nature and many incidents different from Goethe’s version of Faust. During the scene illustrated by Mephisto Waltz No. 1, Faust and Mephistopheles enter a country tavern where peasants are dancing at a wedding party. Mephistopheles tempts Faust to attempt to court the innkeeper’s lovely daughter, but Faust shies away from his request. Mephistopheles becomes annoyed at Faust’s seeming lack of gall, since Faust has already shown courage enough to bet against the devil. He therefore takes out a violin, tunes it and puts everyone under a spell with his playing. After introductory music imitating the tuning of Mephistopheles’ violin, the opening section features a relentlessly frenzied and jagged tune, embellished with a variety of fleeting technical fireworks. Finally, we are led to a more tranquil section where Faust’s theme, a swaying and hypnotic waltz melody is introduced. The development of this theme dominates the end of the piece. It is in several ways transformed by Liszt, as is Faust under the spell of Mephistopheles. Finally at the height of their madness under Mephistopheles’ spell, Faust, his maiden and all the other partiers flee out into the woods. The music may seem at times torrential, but when the scene has played itself out, the stars are still shining and we hear a nightingale singing before the composition’s final chords. 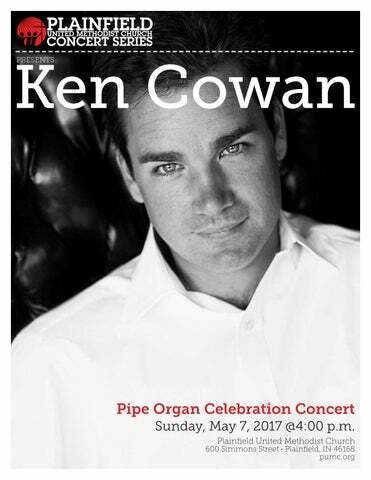 About the Artist Regarded as one of North America’s finest concert organists and praised for his dazzling artistry, impeccable technique, and imaginative programming by audiences and critics alike, Ken Cowan maintains a rigorous performing schedule that takes him to major concert venues in America, Canada, Europe, and Asia. Recent feature performances have included appearances at Verizon Hall in Philadelphia with the Philadelphia Orchestra, Davies Symphony Hall in San Francisco, Segerstrom Center for the Arts in Costa Mesa, California, Spivey Hall, Maison Symphonique in Montreal, and Walt Disney Concert Hall, as well as concerts in Germany and Korea. In addition, Mr. Cowan has been a featured artist in recent years at national conventions of the American Guild of Organists in Los Angeles, Minneapolis and Houston. He has performed at many regional conventions of the AGO and has been featured at several conventions of the Organ Historical Society and the Royal Canadian College of Organists. Numerous critically acclaimed compact disc recordings by Mr. Cowan are available. His most recent releases are Ken Cowan plays The Great Organ (Pro Organo), recorded on the newly-restored organ at the Cathedral of St. John the Divine, New York City; Works of Franz Liszt (JAV), recorded on the Michael Quimby organ at First Baptist church in Jackson, Mississippi; and Ken Cowan Plays Romantic Masterworks (Raven), recorded on the 110-rank Schoenstein organ at First Plymouth Congregational Church in Lincoln, Nebraska. In addition to his solo recordings, Mr. Cowan also joined organist Justin Bischof in the 1999 world-premiere recording of American composer Aaron Miller’s Double Concerto for organ, recorded with the Zurich Symphony Orchestra on the Kleuker organ in the Tonhalle, Zurich, Switzerland (Ethereal Recordings). Many of Mr. Cowan’s recordings and live performances have been regularly featured on the nationally distributed radio show PIPEDREAMS from American Public Media. A native of Thorold, Ontario, Canada, Mr. Cowan received the Master’s degree and Artist Diploma from the Yale Institute of Sacred Music, studying organ with Thomas Murray. Prior to attending Yale, he graduated with a Bachelor of Music degree from the Curtis Institute of Music in Philadelphia where he studied with John Weaver. In 2012, Mr. Cowan joined the keyboard faculty of the Shepherd School of Music at Rice University as Associate Professor and head of the organ program. He is Organist and Artist-in-Residence at Palmer Memorial Episcopal Church in Houston, TX. 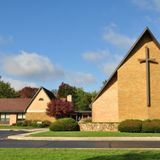 Previous positions have included Associate Professor of Organ at Westminster Choir College of Rider University in Princeton, NJ, where he was awarded the 2008 Rider University Distinguished Teaching Award, and Associate Organist and Artist in Residence at Saint Bartholomew’s Church in New York City. Thank you for joining us today. We welcome you to return soon for weekly worship and other events of the PUMC Concert Series. Sunday Worship Classic Worship: 8:30, 9:50 & 11:10 a.m. NewDay Praise Worship (Contemporary): 9:50 a.m. Youth Worship (Grades 6 - 12): 9:45 a.m. Bible Explorers Children’s Worship (Grade K - 5): 9:45 a.m.